Wastewater lift stations using reliable Gorman-Rupp self-priming pumps. By far, the easiest pump station to use and maintain anywhere in the world. D.J. Gongol and Associates, Inc. are the exclusive manufacturer's representatives for the Gorman-Rupp lines of municipal water and wastewater treatment systems in the states of Iowa and Nebraska. The Gorman-Rupp Company is the world's leading manufacturer of self-priming centrifugal pumps, and we are their proud representatives for municipal water and wastewater treatment applications in Iowa and Nebraska. 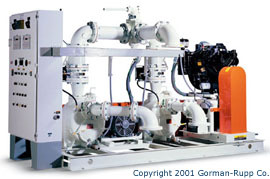 Gorman-Rupp pumps are reliable and easy to maintain. 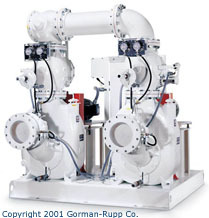 Gorman-Rupp pumps are the best in the world for hundreds of applications in water and wastewater pumping. The Gorman-Rupp T-Series, recently improved and upgraded as the Super T Series, are the industry's leading choice for reliable, long-lasting service. For many applications, a packaged and factory-engineered lift station or booster station is the best choice -- a complete, factory-built station housed in a corrosion- and mildew-resistant fiberglass case that offers easy access for maintenance and upkeep without disrupting the pleasant look and feel of the surrounding community. In other cases, stand-alone pumps or portable pumps are ideal for the application. In other cases, though, you need the advantages of single-source responsibility for the entire pumping station, but you want to provide your own enclosure -- maybe because you're replacing an existing set of pumps or adding to facilities at your plant. Whatever the reason, you should try a Gorman-Rupp factory-engineered base-mounted pump station. takes responsibility for the entire pumping unit, from controls to the pumps themselves. The package is factory-engineered and built in Mansfield, Ohio, and shipped to your facility, where all you need to do is provide power and external piping ...plus the roof and walls. Like many others throughout Iowa and Nebraska, your Gorman-Rupp station will run for years with little routine maintenance -- and none of the hassles of submersible pumps. A base-mounted Gorman-Rupp pumping station means you'll never have to worry about confined-space entry again. Keep the pump -- and the operator -- high and dry with a Gorman-Rupp base-mounted station. where you need some added security and peace of mind, consider a Gorman-Rupp Auto-Start base-mounted station. Auto-Start stations are built with heavy-duty engines that can handle emergency flows when your regular power source goes out. It's a fact of life that the power goes out right when you need it most -- in moments like heavy storms, when your system will face heavy surges. A Gorman-Rupp Auto-Start base-mounted station gives you the peace of mind that your pump station will be ready to operate when it's needed most. Base-mounted stations are just a small part of what Gorman-Rupp has to offer. Whether you need portable pumps, heavy-duty sludge and slurry pumps, reliable and long-lasting self-priming centrifugal pumps, or water-pressure booster stations and wastewater lift stations, count on Gorman-Rupp and D.J. Gongol & Associates, Inc. to help you make your water and wastewater work easier than ever before.